When I read this verse as a young child it had a completely different tone than when I read it today. I think as children we can see the word fear as a threat or something that is bad based on how we first heard that word. We grow up “fearful” of “things” as we are conditioned to believe that somehow we can control the world around us so when we can’t we become afraid. Our “foolish” fears often operate out of our own selfish desires and disrespect for authority. Basically, we surrender to our ego/flesh rather than the spirit of Christ that was given to all that accepts it. The truth is, fear simply means to surrender to or be completely overtaken. Think about a fear you have and the power it has over you. God wants us to not be afraid of Him or anything! He wants us fully surrender to Him. Any fear you have in your flesh has the power to control your thoughts and actions; how foolish to allow anything that is not from God to control you. A fool prefers to listen to the ego and tries to live each day in their own earthly strength, rejecting authority. When you are completely surrendered to God He has the power to begin to fill your spirit with knowledge and His power to accomplish any task. As you surrender your flesh you begin to walk in the spirit of truth which is the beginning of knowledge and as you remain open to instruction His divine plan for your life can begin to manifest. There is no fear when we realize God is only good, His plans will never harm you…to fear the Lord is to completely trust Him with everything. I am complete in Christ alone. 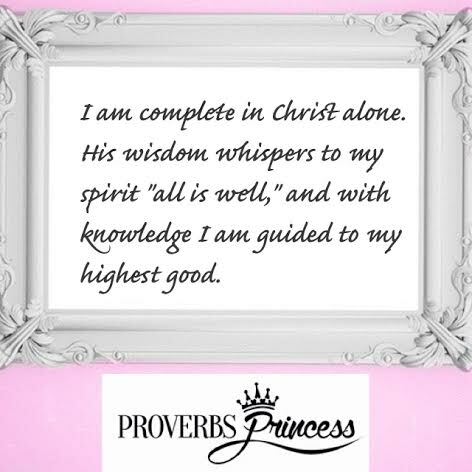 His Wisdom whispers to my spirit “all is well “ and with Knowledge I am guided to my highest good.